Image courtesy of the Office of the Clerk, U.S. House of Representatives A 16–term Member of the House, John E. Rankin of Mississippi chaired the World War Veterans’ Legislation Committee and its successor, Veterans’ Affairs. On this date, the Select Committee on House Un-American Activities became a standing House committee. Representative John E. Rankin of Mississippi resuscitated HUAC from the brink of elimination. Established as a select committee in 1938, the panel initially investigated domestic fascist groups. Under the control of Chairman Martin Dies, Jr., of Texas, however, it rapidly became a soapbox from which New Deal programs were denounced and real and imagined communist subversives were routed out. Many Representatives resented the committee’s costs and its tendency to conduct witch hunts. Most believed it would lapse after Dies’s retirement in early 1945. 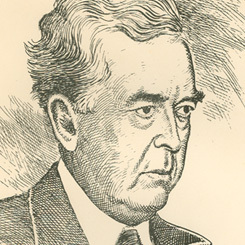 But Rankin, a committee member and a devout segregationist and anti-communist, outmaneuvered House leaders and introduced a resolution to confer HUAC full, standing status at the opening of the 79th Congress (1945–1947). Rankin argued, in part, that the committee should be given greater powers because the records it had assembled provided intelligence agencies “a wealth of information that has gone far toward protecting this Nation from saboteurs of all kinds.” Several Members tried to block the amendment, including Adolph Sabath of Illinois, John J. Cochran of Missouri, and Herman Eberharter of Pennsylvania. But faced with a roll call vote, many Representatives were reluctant to oppose a measure voters might perceive as strengthening America against the communist threat. Rankin’s amendment carried 208 to 186, with 40 Members not voting. At the height of the Cold War rivalry between the United States and the Soviet Union, HUAC’s influence soared and contributed to a climate of domestic fear stoked by its sensational and often unsubstantiated investigations.